The average rain fall in South Florida is about 60 inches a year, amazing especially when it mostly arrives in just a few months of the year during our rainy season which runs from June to September. 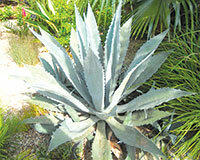 This has not stopped South Florida gardeners from creating cactus, agave and succulent gardens. 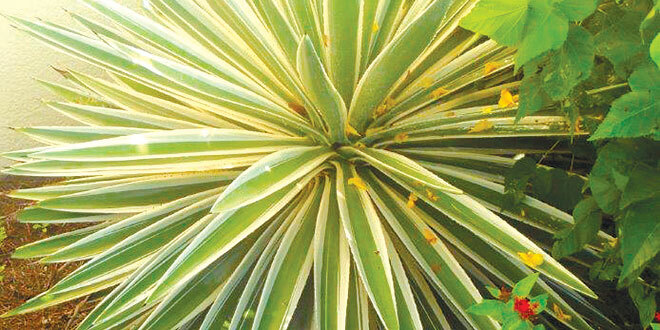 The interest in these plants are on the rise in the past few years as water prices have increased and water restrictions have been implemented. 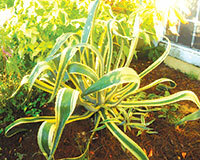 Usually succulents and cacti are found in hot and sunny locations with poor soil conditions. Well, we have all of that here in South Florida and more — lots of rain. It’s been slow to develop, but cacti and succulent gardens are now starting to appear in the South Florida landscape. One reason I know this is my wife began a few years ago with a section of the garden that sloped downward towards the lake planting mostly agaves and succulents, which are to this day thriving, growing and BLOOMING their little hearts out! Remember, you will lose a few plants here and there — just like any garden you plant. I found the larger the plant you use in the beginning the better success rate you will have. all the excess water we get in the rainy season run off quickly. Also planting this garden on a berm helps expel excess water. I feel this is number one in the success of you cactus, agave and succulent gardens here in South Florida, and as always in Florida, a little luck and having Mother Nature on your side always helps. Our soil for the most part is ideal because it contains sand, rocks and little nutrition, typically desert planting material. I really can’t bring myself to call it soil. If all else fails most of these plants can be grown in containers with a sandy potting soil. In containers, little or no water is necessary, making this an easy way to garden for all our seasonally visitors. Their different textures and shapes make them great specimen plants. In Florida’s winter, it is most important not to over water, and drainage is critical because of the cool humid mornings we can have which can cause root rot on plants as fast as it creates fungus in our lawns. One good thing is if you plant a big enough garden you will have less lawn to get a winter lawn fungus. kind. Maintenance free? NO! There is no such thing. Weeds are everywhere. Succulents can survive strong winds, occasionally cold weather, drought, heat and poor soil. Sound familiar? They also have few pests’ band diseases. Besides having the ability to grow under almost any condition, agaves, yuccas and succulents all give your gardens such a variety of architectural shapes. To me, this alone is worth the effort. Beware, most of these plants are armed with some sort of barb, spines and some have down right deadly spikes, so a little bloodletting may occur. One of the newest succulent gardens here in Southwest Florida is at our own Naples Botanical Gardens. In my opinion with its desert like landscape set on a berm, it stands out amongst all the tropical foliage as a real winner. Now when your finished or maybe just finished with phase one in your Southwest Florida arid garden, get out the margaritas, sit back and watch the butterflies and hummingbirds nectar on the flowers of the agave and yucca flowers which they love. We miss your Sunday morning articles. There was something magical about reading about Butterfly Gardening on Sunday mornings. Which succulent plants do Butterflies and hummingbirds need to thrive in SW Florida? Thank you, again for your dedication to butterflies and nature.